Remember the portal is only open until 19th April 2019 so if you want to be part of this batch make sure you complete your application! 1. If you are registering for the first time, click on ‘Mobilization Batch A, 2019’ and then select ‘Fresh Registration’. 3. If you were mobilized in the previous Batches and have registered online before but unable to proceed to Orientation Camp, click on ‘Mobilization Batch A, 2019’ then select ‘Revalidation’ to re-validate your registration. 8. Procedure to apply for Correction of Date of Birth. Get 19 or 20 digits WAEC Verification Pin from any First Bank branch. Login to your Dashboard with your Username and Password. Click on the Date of Birth link. 9. PCMs with wrongly uploaded Thumbprint and Passport Photographs during Online Registration to contact our States Secretariat before the commencement of the Orientation Exercise. 10. PCMs who are in the Medical profession with Expired licence will not be registered in camp, you are advised to renew your licence before going to camp. 11. Part-time graduates are to register on the portal, so they can print their Exclusion Letter on their dashboard when PCMs are printing their Call-up Letters. 12. Cross- check your records before submission to avoid wrong details. 13. Foreign graduates who registered for 2019 Batch “A” are to go to Camp with their Original documents as uploaded during Online Registration for Verification in the Orientation Camp. They should also bring Original Transcript not photocopy and Translation Version of their Certificate to the Orientation Camp. They are to ensure they are verified by the Verification Officers before leaving the camp on any grounds. Failure to comply leads to Cancellation of Registration and will not be posted to Place of Primary Assignment. 14. 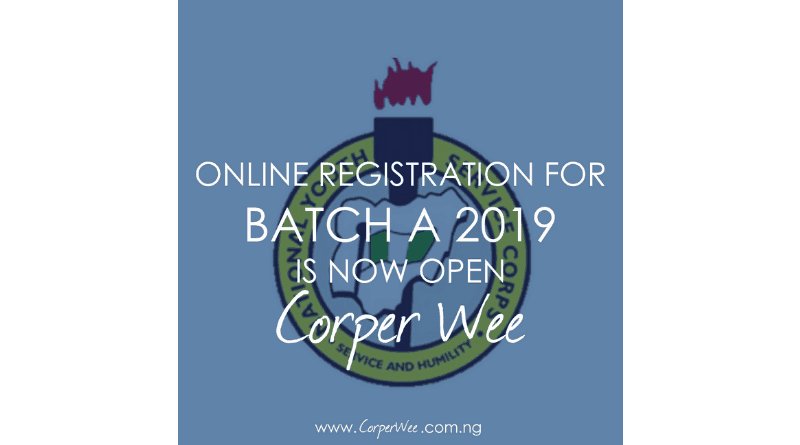 2019 Batch “A” Prospective Corps Members to contact their Institutions, if they are faced with the following challenges during Online Registration. No records found on the Senate list on the portal.